You're invited to experience Robin's on Broadway, a truly unique and elegant salon. 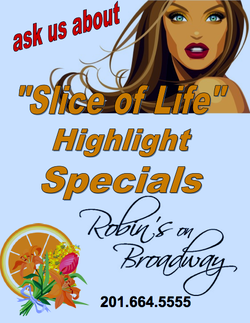 You are always the center of attention at Robin's on Broadway! Thinning hair? Bumble and Bumble's newest addition, Thickening, will turn that thin hair into thick locks. Ask your stylists if Bumble and Bumble Thickening is for you! "Our services and dedication to our clients are unsurpassed and will instill a sense of well-being to make our home your home away from home." Professionally-trained experts use the latest techniques and products available to our industry. Interested in highlights? Talk to your stylist about adding some "slice of life" highlights to your hair. Consultations for services are available for you! Gift Certificates are available and make a perfect gift for someone special!